Behind the Bit: Padre's dressage journey Part III: includes a video! Padre's dressage journey Part III: includes a video! In my first post on Padre, the American Mustang dressage horse, I talked about his Devon breed show win. But he is schooling third level dressage. I'd like to let Patti speak for herself on Padre as much as possible. I asked her: What are Padre's challenges in developing as a dressage horse? What does he do easily? What challenges you as a trainer? 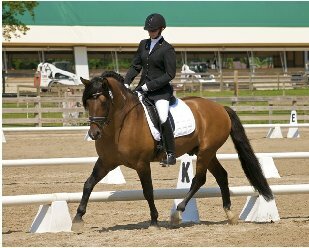 Padre's biggest challenges in being a dressage horse are no different than any other horses. He is able to do everything I ask and he learns quickly and easily. His favorite thing is flying Changes. As a trainer my biggest challenge is to listen to him. He lets me know when I have confused him by halting. He will turn around and look at me like he is saying "I Don't Understand". As a trainer I try to give 100% of myself to Padre and to my students. It is hard to be positive all the time and I know that Padre' is sensitive to my emotions so if I am having a rough day I will groom him or free lunge instead of giving him less than 100%. I have a bond with him that is unlike anything I have ever had with any horse. I have a great deal of respect for him, his intelligence and athleticism. Now, here is video footage of Padre and Patti! Not to start of with a totally negative review here, but that seems to be a first level test being ridden in a double bridle...not quite as nice as a first level test ridden in a snaffle. Still, I do like this boy a whole lot. He is a nice mover and carries himself really well. Too bad they didn't record the commentary after the ride as it was a lesson situation. That would have been interesting. Lovely ride, though, regardless. He's getting some good training from a good rider. Not to worry, Jean. I was about to make the same comment. I would like to see how he goes in a snaffle for a first level test. Despite this, I like the way the rider is carrying her hands. They make a lovely pair. I also would like to see the flying change, which she says is his favorite! I love the look of this horse and his spunky movement. He reminds me of a large Haflinger (also a stallion), which I used to ride and show a bit. Way to go Mustang! It's hard to say about the double bridle, maybe the rider expected to be doing different movements, or maybe the more advanced work wasn't captured on video. I just love the rider's position and Padre's fluidity -- a lovely pair, and I just want to enjoy it. However, they are a lovely, lovely pair. Rider has such a nice seat and hands, and Padre is so willing. I love this little horse! He is so well-balanced and compact and springy. And Patti is a lovely rider. I wish I could get my posture to stay that nice through an entire ride! What a beautiful horse:) Thank you for sharing his story. Definately goes to show that any horse can have a solid foundation of dressage - regardless of breed. Love the Padre posts. I think it's kind of cute that he just stops when he's confused. They seem to communicate well. "As a trainer my biggest challenge is to listen to him. He lets me know when I have confused him by halting. He will turn around and look at me like he is saying "I Don't Understand"
I love to hear from trainers who truly pay attention to the individual horse. (In other hands he might have been punished.) That willingness to converse shows in the ride, and it makes my day. Beautiful video. Double bridle doesn't feel like an issue to me, he seems quite comfortable in it. Great post. Hello everyone, I am Padre's trainer/rider/owner Patti Gruber. I thought I would take a moment to explain the double bridle in this test. Padre' had just started wearing the double two weeks prior to this video being shot. He had cantered for the first time that morning in the double so I did not want to push him to do movements and ruin his acceptance of the two bits. I use this video when I submitt for clinics who want to see just a w/t/c and no movements. It is a great test to show what he is capable of. This was infront of a judge at a Ride A Test Clinic and Padre' received a 74%. Thanks to everyone for your support of Padre'. Where is Padre located? I swear I saw him in Illinois last summer at a dressage schooling show, either that or there are two wildly gorgeous and talented Mustang stallions of the same color doing higher level dressage out there..
Nevermind about my last comment, read the first post. It was him I saw last summer. He is even more stunning in person!